I get the problems people had with the game—it’s pacing is often terrible early on, it’s world is often bloated but feels emptier the more you explore—but replaying it has made me really reappraise it and often positively. For a series so steeped in history and self-reference, it’s one of the only Zelda games at all to really be about history and how it affects the present, both in-universe and as a series. (I’m actually writing an article on exactly this concept.) I love how Hyrule Field’s compartmentalization creates this circular pattern that repeats throughout the game, where each path you take will always have some secret or neat architecture (It’s certainly a step up over the one from Ocarina, which was nothing but tiresome and bland.) I love the dungeons and items, which are wonderfully unique, and quite a few of the set pieces, like the jousts. And I really love the story and cast. The world may be too barren, but it actually feels like it changes from your actions. It’s always going to be in a weird place for Zelda; it’s not as experimental as Majora’s Mask, or as “pure” in its iconography as Ocarina Of Time or A Link To The Past, or as radical as Wind Waker. It’s more of a Zelda mash-up than most of the series, and being about that helps but doesn’t entirely stop that. There are a lot of genuinely great things in this game, even things that have rarely been done in the series before, and I’d really like Nintendo to exploit them in the future. It’s my favorite part about Wind Waker. It’s the one game in the series that really drives home the existential drain of this recurring mythology, particularly in its characters. Ganondorf, for example, is at his best here. 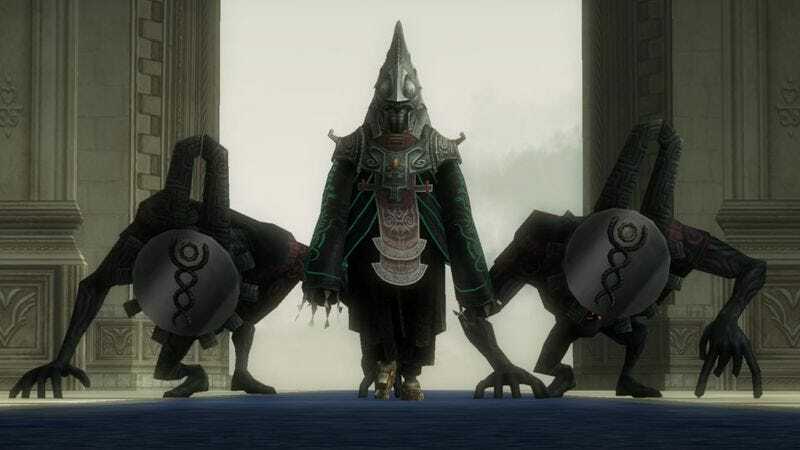 In turn, Twilight Princess engaged its own history but more from a narrative perspective, allowing the characters to slip back into archetypal roles without the awareness WW had. If they could somehow manage both in one game, I’d be over the moon. I find the “barrenness” of the overworld contributes to the game’s melancholic air. The Hyrule of Twilight Princess is the dying vestiges of a once-great empire that has forgotten its past. Everything about the game reinforces that notion, including the fact that Ganondorf is behind everything. When I played it in 2006, I found the barrenness off-putting. It felt unfinished. After a 100-percent playthough last year, I found it less alienating and appreciated the decay of the strange little amphitheater next to the castle, the ghost town behind the boulder, the bridge ramparts, etc. But the endless empty fields around Hyrule Town still feel like underdeveloped settings for the carriage races and the Ganon fight. The following comments discuss story details of Life Is Strange. You’ve been warned. That’s fine to feel good about yourself in that moment, but remember that the game comes down to another binary choice, and it is the only one that makes any real difference: save Chloe or save Arcadia Bay. You can save Kate in Episode 2 (I did), but if you feel the need to save Chloe the game’s finale, then even your compassion comes to nothing. Kate, Chloe’s mother, Warren, and any number of people who have shown you kindness or vice versa all may still get wiped out by the hurricane. They were for me. The impact of your decision-making and rewinding never feels like you’re making that good of a choice in the short term. Your internal monologue is all about picking the lesser evil and second guessing what you’ve done. That’s why I ultimately let Chloe die at the end. I felt like the person that Max had become over the course of the game was someone who Chloe could be proud of—someone stronger and better than the girl who’d left Chloe behind. I figured that best way to honor and respect Chloe was to let her make her own choices, to die in that moment and save everyone she’s ever known. It also shows that Max had learned the value in not trying to control other people’s destiny. I think both endings are fine and even justified. There’s the argument that one should always save the many over the few, but that’s not always true or even right. Plenty of people have focused on saving only loved ones in times of a disaster, just as plenty have sacrificed themselves to save complete strangers. As for Life Is Strange, it’s hinted at that Max has created multiple alternate realities, and that in the end, it’s really a choice about which world you’d prefer to live in. Either choice involves sacrifice. Yeah, but one sacrifice is for your immediate personal desires, and the other is for the unwritten future of dozens, probably hundreds, of otherwise innocent people who we’re essentially told die because of your actions. In the Save Chloe ending, as beautiful as it is, Max is a mass murderer. Regardless of there being other realities, she picks the one where, via her own actions (then inaction), she kills almost everyone she and Chloe ever knew. It wasn’t malicious or purposeful (until the end), but she never has to take responsibility for it. How can they possibly have a happy life together after that, in the long term? Chloe was willing to die, and while she might be thankful that Max chose her, it also means Max let not only her father die but her mother, too. The only “right” ending, in terms of Max’s character arc within a coming of age story, is to save Arcadia Bay. The other ending is perfectly valid as a personal choice, and even works in realistic opposition to the standard coming of age story, but I don’t think it’s the one the creators would have picked in a non-game context. That’ll do it for this week, Gameologicians. Thank you for reading and commenting. We’ll see you next week.